Tixall is a small village in Staffordshire located between Stafford and Great Haywood in the North West of England. It was originally built as mews and stables as part of the Aston Estate and is close to Tixall Gate House which has a heritage of over 400 years. The mews were an addition built in the early 19th century and were used as stables, coach houses and accommodation for grooms, coachmen and other servants. In the 1970’s the mews were converted for residential use and are currently a Grade II listed building. This means that they are of special interest, warranting every effort to preserve them and of course that any repairs have to blend in with the surrounding architecture. One of the two storied embattled towers needed repairs to the roof and it needed protection from the weather while the work was carried out. 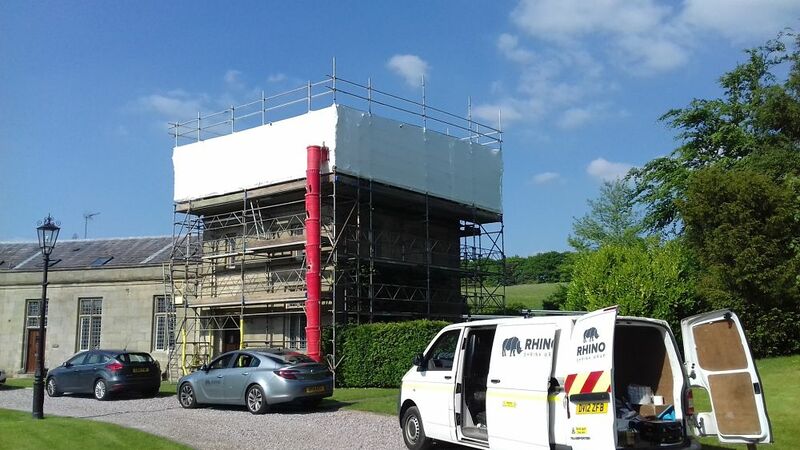 By setting up a temporary roof using Rhino Shrink Wrap, the repairs could be carried out quickly and efficiently. Thank you for taking the time to read this case study. Please do contact us with your questions or comments. We look forward to hearing from you.